Do you know where your Horizon Line is? Hmmm, could this mean that our viewpoint affects what we see? Definitely! So far so good, as long as you want to draw a picture of the ocean. How do find the horizon line when you’re in the mountains, surrounded by skyscrapers in the city, or even sitting in your living room? Simply establish where your eye level is. No matter where you are, if you can find your eyes you can find your horizon line. Then, image a flat plane slicing through the scene in front of you, level with your eyes. Everything above this plane will recede DOWN to the horizon line. Everything below this imaginary plane will recede UP to the horizon line. 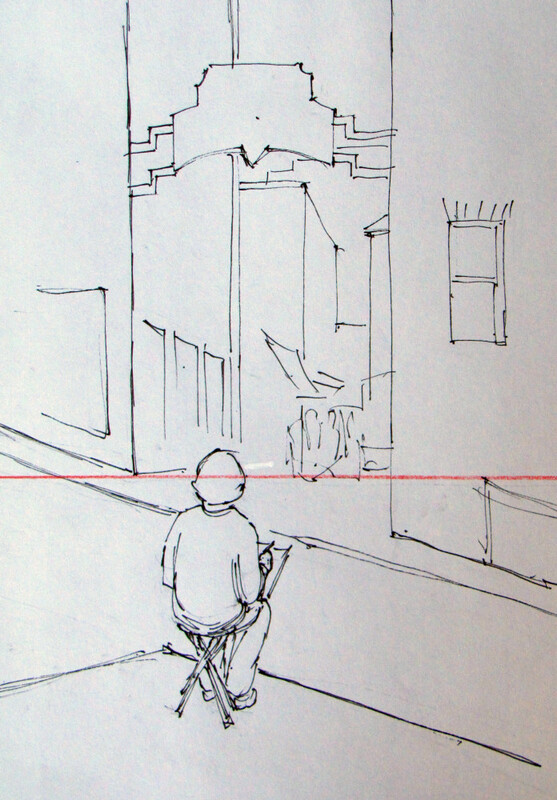 Example: A year or so ago I was drawing in downtown Seattle with Urban Sketchers. 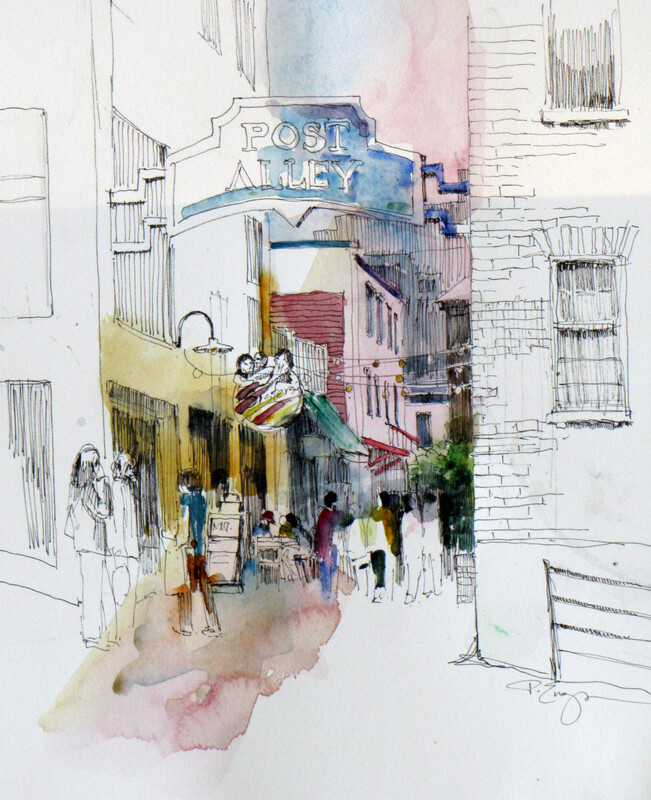 I decided it would be fun to do a sketch of Post Alley. 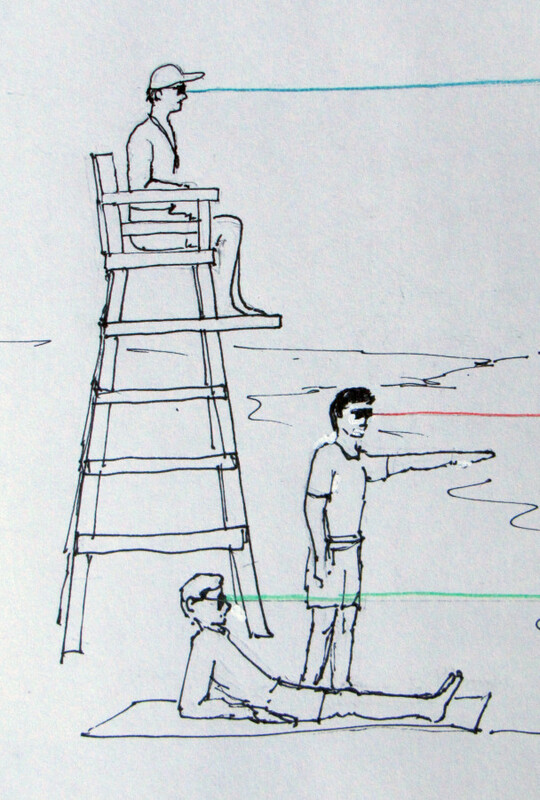 I took a seat on my folding chair on the side walk and determined my horizon line – eye level. Note that even though I am on a hill – the street slopes down – the horizon line is level. It will always be level/parallel with the horizontal edge of your paper. I started by drawing the horizon line as a light pencil line on the paper. Next, I drew in the strong vertical lines of the corners of the buildings,and from there found the angles the horizontal lines going down to the horizon. Unfortunately I didn’t take photos of the drawing as I was working on it, but here’s a quick sketch of me drawing with the horizon line added to the scene, to show how my position relates to the finished piece. Wherever you are this week, try to find your horizon line.